Which Of These Creatures Produces Light At Nearly 100% Efficiency? Which Of These Fruits Contains A Powerful Natural Meat Tenderizer? Fireflies (also known as lightning bugs) are a small group of insect species found in the Lampyridae family. Found in temperate and tropical climates on every continent save for Antarctica, the tiny glowing creatures are not just a pleasant and whimsical element of warm weather in the climates where they are found, but an example of exceptional efficiency in nature. 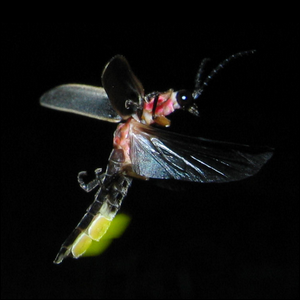 The glow produced in the firefly’s body is the byproduct of a chemical reaction between the enzyme luciferase and the light-emitting compound luciferin, in the presence of magnesium ions, adenosine triphosphate (ATP), and oxygen. This chemical reaction, bioluminescence, is so efficient that nearly 100 percent of the energy used in the reaction is converted to light. By contrast, a traditional incandescent light bulb is about 10 percent efficient as 90 percent of the energy is waste energy emitted as heat instead of light. While light sources powered by the actual chemical reaction in fireflies aren’t likely in the technology cards (because of a variety of issues like storing organic chemicals for extended periods of time), that doesn’t mean that fireflies haven’t already contributed significantly to improving lighting. Scientists studying fireflies examined the structure of their bodies and found that the layer over the fireflies’ light emitting cells has a scale like pattern that helps minimize light reflecting back into the abdomen and maximizes light escaping from a firefly’s body. By designing LED diodes with a similar pattern, they were able to boost the efficiency of the LEDs by as much as 55 percent. Image courtesy of art farmer.